A : The Garlic Twist is a full-function manual kitchen tool for preparing garlic for cooking. It provides a simple means to help you to remove the skin of the garlic clove, and then to mince and gather it. Please refer to the instructions for its use. A : You can always stuff it full but you should at least use two medium size cloves, for better tasting dishes, and for health, as well as enable to Garlic Twist to properly gather the minced garlic bits. The Garlic Twist is made of tough polycarbonate and is top rack dishwasher safe. It can easily be cleaned with a quick rinse under running water. Let air-dry. Q : have weak wrist and I find it hard to twist to mince garlic. What can I do? A : Hold the two halves of the Garlic Twist slightly apart while you twist back and forth. This allows you to shred the garlic cloves layer-by-layer. If this is done correctly, you shouldf indhardly any effort is required. Alternatively, drop in two cloves of crush-peeled garlic inside the bottom half of the Garlic Twist, then position the top half such that its mincing teeth are directly on top of the cloves; then push it down to allow the mincing teeth to crunch into the cloves breaking them apart for effortless mincing. A : The Garlic Twist can be used to mince pre-sliced ginger. 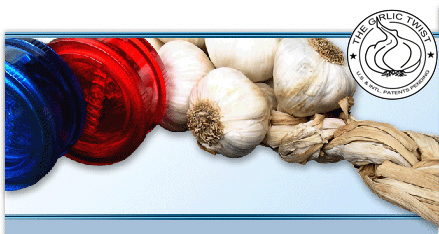 Some users have found the Garlic Twist to be ideal for mincing shallot or Jalapeno pepper for use in making Salsa. It can also be used to mince onion except it is limited by the quantity it can mince each time. Q : Can I store minced garlic inside the Garlic Twist?